July was a big month for the Social Pros Podcast. 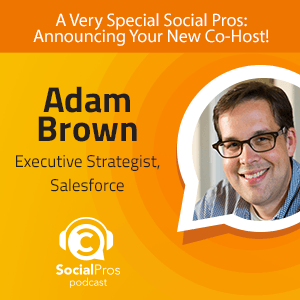 We transitioned co-hosts from Jeff Rohrs to Adam Brown, who brought his digital strategy experience from Salesforce to us as the first guest of the month. We also had strategists from TaylorMade-adidas Golf and SAP (with a customer experience marketing bonus! ), and let’s not forget our social legal expert from Dell. Whether working in sports, computers, or marketing, these Social Pros know the value of delivering good content on social media. And owning that content is the only way to make sure you don’t get caught by copyright issues or changing rules and regulations on social media platforms. While you’re at it, you might even want to develop your own social platform to avoid dealing with the changing rules and regulations on today’s social media platforms. As the Executive Strategist at Salesforce Marketing Cloud, Adam Brown is on the front line, watching the transformation of marketing as social media continues to develop. Marketing and communications departments are beginning to meld as we see the evolution of the new Chief Digital Officer. Subspecialty social media groups are developing at the practical level in PR and ad agencies. And we’re also seeing the emergence of completely brand new sub-boutique agencies that are specializing in digital marketing. The technology is great, but if you don’t have compelling content, it’s not going to work. As the balance of power shifts toward paid and away from earned, marketers with traditional budgets will need to reallocate funds, and for those without traditionally paid budgets will need to figure out how to get the same level of engagement as they had even months before. You have to be a good storyteller. Regardless of how many new shiny platforms and digital tools emerge, the ability to tell a good story is vital to successful marketing. You need to use the data available through social listening to inform what you’re doing. Even companies who are doing a lot of work in social media aren’t utilizing social listening. Even if they’re using a social listening tool, they’re not making the data actionable to either inform new content, inform what competitors are doing, or to even inform what platforms and times might be best for them to get engaged and participate in conversations. At a huge company like SAP, employee advocacy is a great way to harness the passion and knowledge of the people integral to its success. 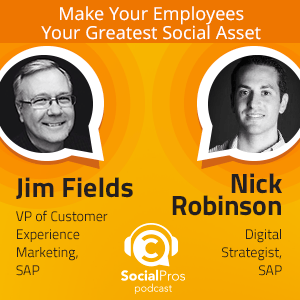 Jim Fields, VP of Customer Experience Marketing, and Nick Robinson, Digital Strategist, are true advocates of employee advocacy (see what we did there?). SAP’s social selling and social competency programs make it possible to use all 75,000 employees as ambassadors for their brand. We can do really interesting things when meshing traditional & non-traditional marketing tactics. Another way SAP looks to utilize social is through social selling. There is a lot out there about earned, owned, paid, and shared social. Social selling is a brand new category that’s emerging in the field. It’s perhaps not the best name for the category, because it’s really not about selling something to people. It’s about sharing points of view and content to let people know our brand can help them. Brands need to leverage authenticity and connect to consumers on a personal level. Social selling is a way to do that by making those personal connections on social media. 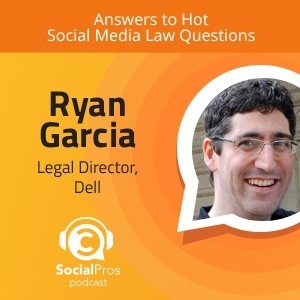 As the Legal Director of Dell, Ryan Garcia is very familiar with the challenges social media brings to the table, not only for marketing, but in just about every department within a company. When it comes to creating content, Ryan recommends creating your own to avoid falling into copyright issues. It’s difficult to generate your own content on the scale you might need for your business, so the next best thing is to make sure you’re working with partners, like a content creation agendy. At the very least, if you’re using consumer-generated content, make sure you know who the original rights owner is before using that content. The easiest thing is always to be generating your own content. 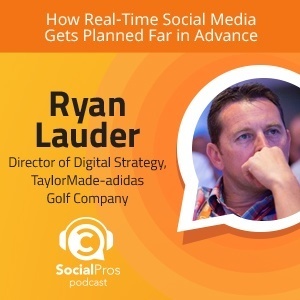 Ryan Lauder, Director of Digital Strategy at TaylorMade-adidas Golf Company (TMaG), has his dream job, combining passions for golf, digital communication, and social media. He and the team at TMaG have been working on an owned social media platform for two years and are waiting for the right time to launch it. We’re not trying to promote our players or brand, but just be contextually relevant to our audience. The platform was created to improve the connection with their audience, specifically golfers. It’s designed to be a place where golfers can connect with their community. Not only that, but it will be used as a research tool for TMaG to better serve their audience. They’ll be able to build better golf clubs and serve golfers’ needs with the information they access through the platform.